Time flies so quickly, it's already 10th of September and time to post one more recipe for our Potluck Party, Cyber Style ! Lately with birthday celebrations and many festivals, we've taken it a little easy on the healthier food! We decided to make something that would be light on the stomach, filling and delicious ! This next recipe is perfect for that. The main ingredient being daal makes a filling lunch. Daal or lentils are staple in my vegetarian kitchen, lentils provides us with a daily dose of protein and fibre to my family. Especially yellow lentils are quick to cook and is very versatile - you can make sweet or savoury dishes from it ! The addition of cucumber and tomato freshens and lightens the salad. The red onion provides a crunch and the coriander and mint leaves give a burst of flavour when eaten. This Salad is prepared without any dressing just fresh lemon juice, raw mango and chaat masala to make the salad tangy and refreshing. The good thing about the salad is that the taste isn't so overpowering that you can't eat it with anything else, making it useful as both a full lunch or as a side salad! It's very colourful, hearty, summery and easy to prepare - always useful! The salad was a success for everyone in the family - an empty bowl is always a good sign! Clean and wash daal 2-3 times under stream of water. Soak in a water for 1-2 hour. Heat 1 tbsp oil in a non stick pan, add cumin seeds, when splutter add hing and turmeric powder. Straight away add cooked daal, stir and add red chilli powder , salt and sugar. Cook daal for 2-3 minutes and turn of the heat. Let the daal cool at room temperature. Add other ingredients and serve immediately. Note :- Daal can be cooked and store in the fridge on previous day. When you are ready to serve add other ingredients. DO NOT add onion , sev and peanuts until you're ready to eat. Instead of raw mango any tart fruit can be used like apple or pineapple. 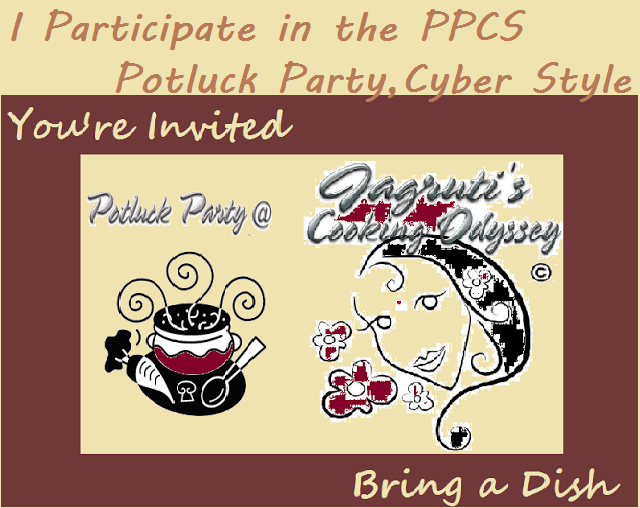 Linking it to Potluck Party, Cyber Style fun challenge started by ME, this month guest host at Sowmya's. Also Made with Love Mondays ! wow very crunchy and delicious looking salad.. The Chatpata Dal looks so CHUTPATAH... would love to have a bite or may finish the bowl. Lovely salad.. beautiful pics also.. Thanks for sharing.. I would surely try it..